Motorcyclists are often at greater risk of being involved in accidents, and it's usually not their fault. This risk stems from many different issues, typically the inattention of other drivers or dangerous road conditions. Our legal professionals have been working with injured motorcyclists for over 35 years, and they've seen the devastation a motorcycle accident can cause. If you or a loved one were injured in a motorcycle crash, our law firm can help recover the compensation you need for medical bills, lost time at work, and more. No matter your type of accident, get a free consultation now by calling us at 1-866-943-3427. We're available 24/7 to help answer your questions and get you the legal help you deserve. Left-Turn Collisions – These accidents can be extremely dangerous and even deadly. When another vehicle turns across traffic, they enter your lane. If they aren't aware of you or don't execute their turn fast enough, you could collide with their vehicle causing serious injuries. 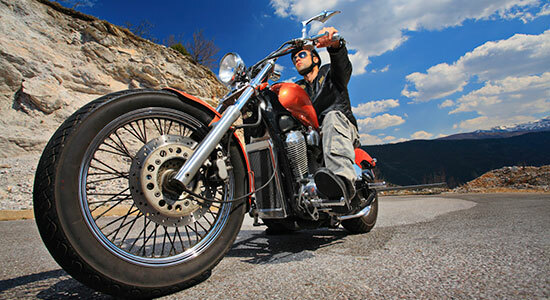 Single-Motorcycle Accident – Motorcycles can be prone to skidding, tipping, and sliding. If you've been injured in a single-bike crash, you could be entitled to compensation. There may be issues that caused your accident that are not obvious. Rear-End Accidents – If you're riding a motorcycle and are hit from behind, you could suffer serious injuries from the collision. You could be entitled to compensation for your injuries and missed time at work. Drunk Driving Accidents – Drunk driving affects all drivers – no matter the vehicle. Despite the awareness that's been raised against driving under the influence, some people still make the decision to drive drunk. If an intoxicated driver has injured you, get the compensation you deserve for your injuries. Injury cases have time limits – otherwise known as statutes of limitations – that may affect your claim. Contact us right away, and we'll get started on your case.